The Gramercy Sous Vide is a better than average quality model, that has an easy to use design, and is value priced to accommodate most budgets. Easily confused with other higher-quality models. $85.97 Current Price - YOU SAVE $49.01. The Gramercy Sous Vide Precision Cooker takes its design inspiration from one of the most popular sous vide models on the market. It's a good quality model, that's better than average for quality, and with a great budget price. The Gramercy Sous Vide looks like A LOT like the Anova Bluetooth Sous Vide, this isn't a bad thing, but we can't help but wonder how many people bought this model because it looks confusingly similar. It's 16.5" tall, making it one of the taller than average. 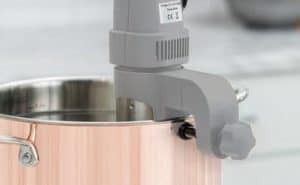 It does have an adjustable clamp that opens to just under 1" in width, however there isn't a lot of adjustment up or down, so you'll have to pay attention to monitoring your water level closely on extended time cooking activities. The control unit is made of high impact poly carbonate and feels very solid, and the heating element is contained in a metal tube, so the quality here is better than average. Overall this is a well-made appliance that should hold up under heavy use. The power on this model is 800 Watts, which is below the average of 1000 Watts. This just means it will take longer to get up to the temperature where you're cooking your food. The flow rate is 2.2 GPM which is slightly above average of the models we tested. The lower power is actually a benefit for this model. The design doesn't allow you a lot of adjustment vertically so for extended cooking projects you usually have to monitor your water level more closely, but because the power is slightly lower you have some wiggle room and don't have to constantly baby sit things. As we noted the design here is very similar to the Anova models, which means it's really clear what's going on and it's very easy to learn how to use. The scroll wheel is a lot easier to use to adjust the temperature over big differences. The upper temperature tells you the current temperature of the water, and the lower temperature gives you the set point. 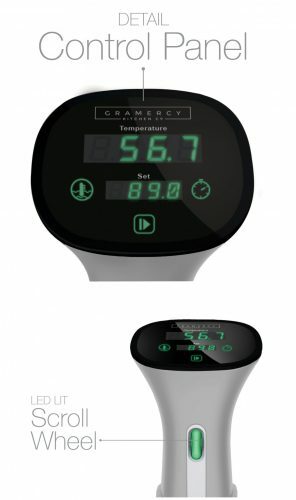 We prefer this dual temperature display, as opposed to a single display that alternates between the two. The timer on this model is really awkward to set. We recommend using a standard kitchen timer or your phone, it's just not worth the headache. This model does not have Bluetooth or Wifi Connectivity and does not connect to an Amazon Alexa. This is a good little unit that has most of the features you're going to need, is better than average quality and has a great price point. As long as you don't think you're getting the Anova Bluetooth Sous Vide at a lower price, you should be very happy with this model. 16.5" x 8.3" x 4.2" 11.1" x 14.8" x 4.5" 16" x 3.5" x 3.5"
The Gramercy Sous Vide Precision Cooker combines great quality, feature rich offering, easy to use design and is available at a great price.